While spring used to be all about vacations, now the time is known for giving your home a thorough clean. This year, consider including your vehicles on your cleaning checklist. Regular cleaning is important to keep your home looking tidy and clean. However, throughout the year, junk and personal items begin to accumulate throughout the home until your regular cleaning is barely keeping up with the mess. A spring clean is a great way for you and your home to get a fresh start. Much like your home, your vehicles also suffer the same accumulation of clutter, however, rarely receive regular cleans. With this in mind, this year, include your vehicles in your spring clean. Synthetics Northwest has prepared a post with some points to get you started. Don’t rush the task. Instead, be thorough. If possible, bring your car out into the sunlight to help see better. Check your wheels for lodged debris, cracks, and any other sign of damage. Check your tires for cracks, chunks taken out, bald spots, and punctures. Make sure each tire has the correct pressure. 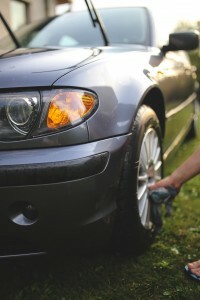 If you can see any problems with your wheels or your tires, be sure to have it looked at before driving on them again. Otherwise, a thorough soapy wash and clean is all that’s needed. Instead of using cheap products, only use high-quality lubricants and fluids. Instead of topping it up again, flush it out and replace the fluid or oil. If you spill any fluids, clean it up as they occur. When you are done, store the remaining bottles upright in your trunk. Click here to buy Signature Series 5W-20 Synthetic Motor Oil and improve your engine performance with a synthetic oil change. To find out more about how a synthetic oil change can reduce your engine wear and gas usage, speak with an expert at Synthetics Northwest by calling (503) 371-7184 or check out the online store. Even though it’s only small in size, your battery is one of the most important aspects of your vehicle. This is simply because, if your battery stops working, your car won’t even turn on. A visual inspection will be sufficient to know if your battery is in good health or is in need of replacement. If you can see grime or dirt built up on the cables or the terminals, safely wipe it clean with a dry cloth. If you can see corrosion or any damage to the battery, it’s worth replacing it now while your car is sitting in your driveway instead of when you are stuck in a carpark with a trunk filled with melting grocery items. As much as you don’t want to, everything needs to be taken out of your car before you can clean it, including personal items, junk, and anything in the storage compartments. If you have seat covers, remove them and wash separately. Before you reinstall them, it’s important that they are completely dry. Your vacuum attachments can help you to reach more places, such as high up where the pedals are or under the seats. Removing the carpet from your trunk to wash it is a great idea if it’s possible. If not, consider using spot-stain remover or a carpet-freshening product. Use a damp clean cloth to wipe away dirt and grime from rubber seals, controls, and knobs. Performing the above tips is a great way to help keep your vehicle in good shape and improve its performance. Of course, your car isn’t the only vehicle which can benefit from spring maintenance such as a synthetic oil change. A synthetic oil change can also boost the performance of your ATV, boat, and even lawnmower. Speak with Synthetics Northwest at (888) 283-3580 (Toll Free) to find out more and to place an order.